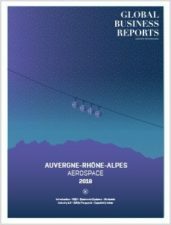 Combining the Cluster’s aerospace network and the access Global Business Reports has to the international executives, makes this report a key way to communicate the know-how the region presents to a global audience in time for the growth period. For each of us GBR offers an effective means to secure the best visibility to connect with global decision-makers and support the initiative of this report. So far, companies within the region are generally making positive steps towards incorporating Industry 4.0. The facilitators of this progress are primarily located within the region itself: a thriving market has emerged of companies geared towards assisting other SMEs to incorporate Industry 4.0 in an affordable and sustainable manner. With companies in Auvergne-Rhône-Alpes at all stages of the value chain, from industry leaders such as Michelin, working in partnership with Safran, to more niche SMEs, developing the electronic components of tomorrow’s aircrafts, it is safe to say that the region has earned its reputation as a hub for innovation.